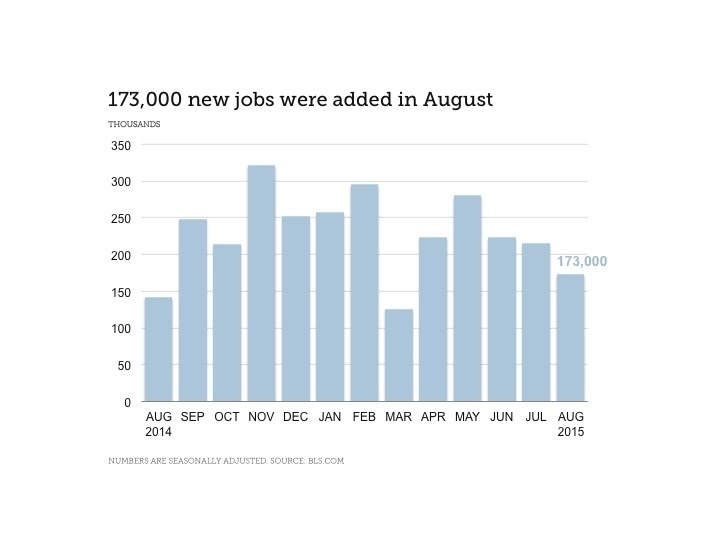 According to BLS’s latest jobs report, the U.S. economy added 173,000 jobs in August. That figure is weaker than expected as economists had expected a 220,000 increase for the month. There’s a good chance that the Department of Labor will eventually revise August’s employment data. Employers typically lay off end of summer jobs during the month. Additionally, there may be a seasonal uptick towards Thanksgiving as companies hire extra workers for the holiday season. While U.S. workers are improving on productivity, wages continue to stagnate. Last week, BLS announced that nonfarm business sector labor productivity increased at a 3.3-percent annual rate during the second quarter of 2015. Output increased 4.7 percent and hours worked increased 1.4 percent. Despite these output gains, wage increases for the past two years have been disappointing. Despite such trends in earnings, consumer spending is up. According to BLS, average expenditures per consumer unit in 2014 were $53,495, a 4.7-percent increase from 2013 levels, the U.S. Bureau of Labor Statistics reported today. During the same period, the Consumer Price Index (i.e., the price of goods and services) rose 1.6 percent. Federal government employees are on track for a 1.3 percent pay raise in January, unless Congress blocks such a move by President Obama. Some Democrats and several unions are pushing for a 3.8 percent increase in what may be a politicized move in the midst of an election cycle.